Please, respect that wine farmers do not oinly sell their products but do vine-farming and wine-making works each day. You can purchase and taste the wine individually in Salánki Family Wine Cellars in opening hours. If you happen to take part in a wine tasting event with a group, please, contact us via e-mail or on the phone in advance. Museum-piece wines from own supply back to 1980. On the spot, at wine tasting events of the cellar, in various wine-shops and at retailers. Contact us on the phone. Salánki Family have been involved in wine-making and vine-farming since 1973. They do farming on over 20 hectares following the family traditions. In their centre in Aszófő, the cellars, the wine-stock, the wine museum and rooms for accepting guests can be found. Salánki Family Wine Cellars is in a lucky situation, as they are able to organise wine shows with meals for even 250 people at the same time. Sometimes it happens that the village day of Aszófő is held here due to the rainy weather. The multi-generation wine-making experience of the family is combined with a high-lvel professionalism, as most members of the family have a university degree in this field. In Balaton region, Sándor was the first to compile the origin protection regulation of Tihany, where most of their vineyards can be found. Among the wines of the cellar, everybody can find the required one. 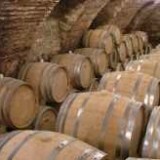 It is the white wines and rosé of the latest years that are sold, while, after a one-year-long seasoning in a barrel, red wine is kept in bottles for another year before putting it on the market.